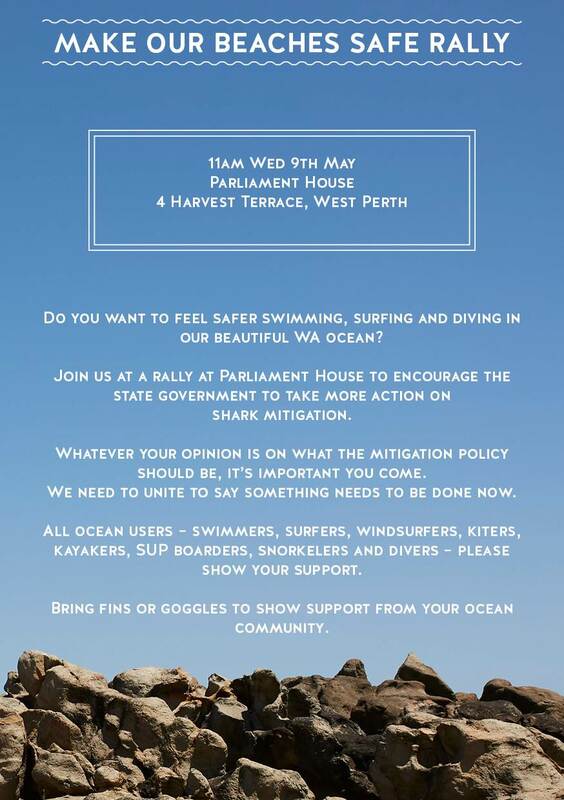 "Make our beaches safe rally" Fair enough, but you only mention sharks in the poster. Drownings at WA beaches outnumber shark tragedies by about 6 to 1. To make beaches safer you need more focus on the drowning issue. What about.....stay out of the water ?? particularly when it happens to be salmon season and near 200 whale strandings along the coast in the same 2-3 week period. ****me. Anyway, whoever heard of a windsurfer being bitten?? We employ thousands of lifeguards with jet-skis at huge cost to mitigate drownings. Remind me what is being done to mitigate shark attacks apart from occasional air spotters and a subsidy to buy shark shields? ... should I go on ? That 6:1 figure doesn't include all the people that were saved. Indeed the best value-for-money for saving lives, is to teach people how to swim in rough water. And if you really want to be pragmatic about saving human lives you have to do the unsavoury thing and put a dollar value on it. So then you would look at how many lives were expected to be saved by your shark mitigation expenditure. You would also have to evaluate the drowning probabilities vs. the change in people's swimming behaviour due to the perceived risk of shark attack. You've already claimed that this does happen. You'll have to quantify it. Do they choose not to swim? Are they more likely to swim between flags? Do they not swim in overcast conditions? Do they not swim out above waist deep? You might find that each shark attack has such an effect on swimmers' behaviour that 2 or 3 are saved from drowning? Doing nothing about sharks and spending all the money on learning to swim courses may be the best way to spend dollars. Alex, WA, fair call, but you and I both know its not just the last few weeks. Interestingly though, the majority of the negative comments and those that say spend the money elsewhere, are not from WA. Hmmmm, shark nets, drum lines, smart drum lines all in use over there. Major population centers with regular air patrol, well equipped coast guard, highly funded SLSC with all the kit, the list goes on. Any of you looked at what is currently spent in QLD, NSW and VIC on shark mitigation measures both directly and indirectly? WA recently copped a flogging from the bandwagon riding East Coast do-gooders regarding drum lines and plans for netting.....and they have everything that they were protesting against already in the water FFS (not implying that you guys were personally protesting of course ). I would like to invite you guys over to WA for a sail, paddle or kite. Lets see how you handle sharing the lineup with an increasing number of large sharks without all those controls you have in place over there. Better yet, bring the kids for a surf and see how it feels once they're out the back on their own. We have a coast line of similar length with a minute fraction of the spending. All the Safe Shark group are asking is for some action from our hand-sitting politicians on a number of mitigation measures that can be put in place on sections of our coast, research and detailed testing of personal protection devices that suit more water users than divers and research into the actual size (not guesses) of what the GW population may actually be. Its a sensible rally aimed at bringing change. Its time those that want the change to bring forward their ideas and support. WA water users, get on board with this one, it's time. Interestingly here in Vic we don't have any shark prevention measures other than the occasional plane and the SL clubbies. The last one is usually nowhere where I surf and swim. Where I surf occasionally there are lots of seals and very large GWS. Never seen one or heard of an attack. They run a swim event every year 1km from where a 4/5 mt GW lives in one of the channels. No sure why WA is a hot spot ATM , maybe that's why they should look into. Remember SA was pretty hot for sharks a few years ago. Now ???. I just think it's a hysterical reaction generally. Riding a bicycle in rush hour has to be way more dangerous than swimming just about anywhere. Anyway, as if the WA govt is going to install whatever mitigation devices you choose at grace town/margs/Esperance/gero etc. they'll act where the populace is; where votes lie. Ie metro areas. The headline grabbing events of the last couple weeks would continue. I freedive a lot over summer at Augusta for crays. Always feel exposed as fk. Never seen anything tho. I can't see how bobbing lines to north would change that. And why should they? I choose to do what I do. Take responsibility for yourself and your choices and actions, I say.